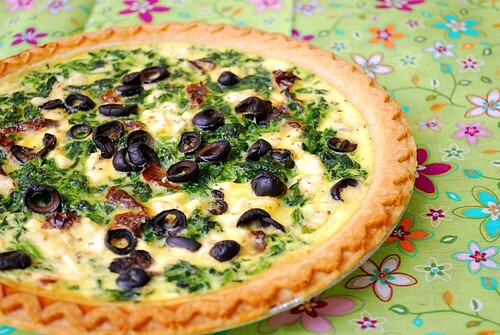 For this quiche, I used frozen spinach which was thawed and squeezed of any moisture. This is key so that the bottom crust doesn't get soggy. The easiest way to this is to place the thawed spinach in a piece of cheesecloth, gather up the ends and wring it completely. You can use either sun dried tomatoes that are dry or packed in oil. Just be sure to blot any excess oil if using those packed in oil. Lastly, if you wanted to add more protein, I suggestion chopped chicken breast which pairs well with these ingredients. Place the sun dried tomatoes and spinach into the prepared pie plate. Sprinkle 1/2 cup crumbled feta cheese over the spinach mixture. Season with salt and pepper. In a medium bowl, whisk together eggs and milk. Season with salt and pepper. Pour into the pie crust over the spinach mixture. Bake in preheated oven for 30 minutes. 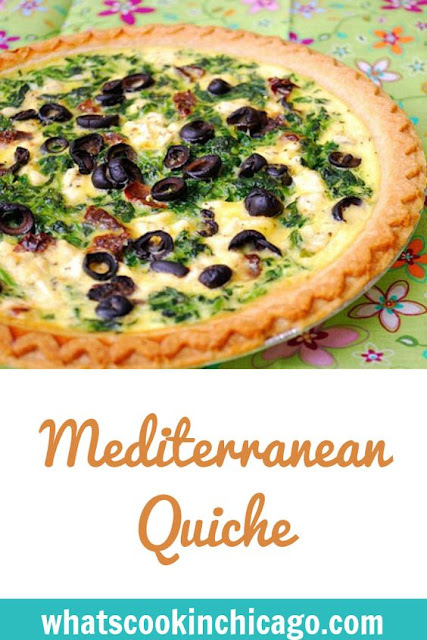 Sprinkle top with the olives and bake an additional 15 minutes, until set in center. Allow to stand 10 minutes before serving.